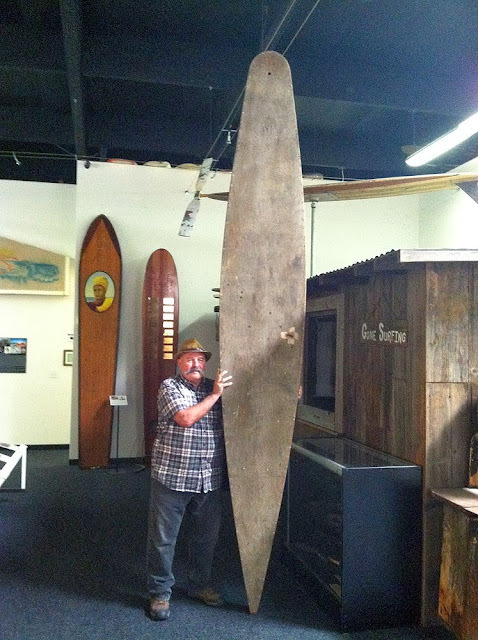 Amaro Lozano's uncle Claudio Acevedo had this paddleboard for over 40 years. Amaro's wife told him the board needed to go, so rather than chop it up for firewood, Amaro decided Surfing Heritage would be a good home for it. Most likely built sometime in the late-1930s to mid-1940s, this looks to be a well made do-it-yourself model, most likely based off of Tom Blake's blueprints that were produced in Popular Mechanics in 1937. There's a hole on the deck where Claudio had patched it with some bandaids. Great pic of my hubby, and it's true, i told him to burn it in our outdoor fire-pit. Or make it into a bar.......but soon, i didn't want it hanging around in our garage for another 40yrs.